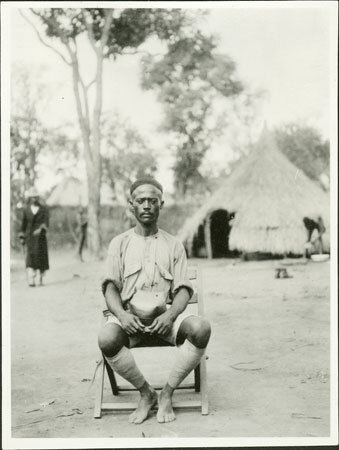 A portrait of a seated man (identified as chief Ndoruma, a son of Prince Rikita) holding a straw hat, with a compound and hut (dondomo type) beyond. He is wearing leg bandages. Notes on print/mount - "Ndoruma wili Rikita 96 AIII/5 EPA587"
Notes on card mount m/s pencil - "SSS overall Ndoruma wiri Rikita 8.89"
Morton, Chris. "Zande prince's son" Southern Sudan Project (in development). 03 Jan. 2006. Pitt Rivers Museum. <http://southernsudan.prm.ox.ac.uk/details/1998.341.587.2/>.